If you are a fan of the Ice Age movies, then you are probably aware that today is the launch date for Ice Age 3 Dawn of the Dinosaurs! Ice Age 3 Dawn of the Dinosaurs is available in a three-disc combo pack (Blu-ray, DVD and a Digital Copy) for a suggested retail price of $39.99 (Amazon.com has it listed for $23.49). The single DVD is also on sale for the suggested retail price of $29.98. (Amazon.com has it listed for $14.99). For a limited time, you can also purchase a “Scrat Pack” double DVD pack, featuring an overload of special features focusing on the determined squirrel including three “Scrat” games exclusive to the disc. The “Scrat Pack” is available for the suggested retail price of $34.98. If you plan to buy this movie in store, be sure to print the $5/1 Blu-Ray coupon here. You can also find $2/1 coupons for the previous Ice Age movies here. 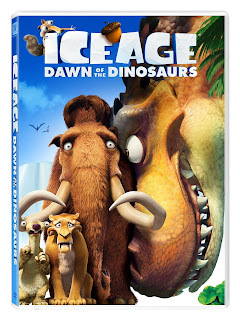 I am really excited, because I have 3 copies of Ice Age 3 Dawn of the Dinosaurs to give away to 3 of you! 3 winners will receive an Ice Age 3 Dawn of the Dinosaurs DVD. 4) Promote this giveaway and/or blog. If you don’t have a blog, you can Tweet about it (follow me: I’m @stretchingabuck), post about it on your favorite forum, or tell your friends about it! However you decided to promote it, be sure to come back and leave a comment letting me know how you did it. Friday, October 30th at 10 PM, EST. The winner will be chosen via the random number generator at random.org and will be announced no later than Monday, November 2nd. Please note that if I do not hear from the winner within 4 days that another winner will be chosen. Review/Giveaway Disclosure: I was given one preview copy and one regular copy of this DVD. The DVDs for this giveaway were also provided by 20th Century Fox. You can view my full disclosure policy here.